The American Flag is the symbol of freedom recognized all over the world. We fly our flag in schools to teach our children who we are, what we stand for and to bring children from different races, religions, and ethnicities together under one common people. “E pluribus unum” means, “Out of many, one” The American Flag is the symbol of this motto. 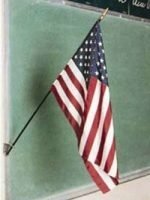 Centar Industries is proud to offer several variations of the American Flag for use in schools and classrooms including indoor and outdoor flags. So take a look below and choose a flag for your school or classroom and spread the love through the symbol of freedom – The American Flag!